The Healthcare Foundation of New Jersey is an independent, endowed grant-making organization dedicated to reducing disparities in the delivery of healthcare and improving access to quality healthcare for vulnerable populations in the greater Newark, NJ area and the Jewish community of MetroWest NJ. 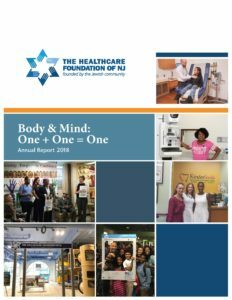 The mission of the Healthcare Foundation of New Jersey is to improve the health and well-being of vulnerable, underserved populations in greater Newark and the Jewish Community of MetroWest NJ, elevate the quality of community healthcare, reduce disparities in access, and promote the infusion of compassion and humanism into our healthcare system. The Foundation seeks to seed new initiatives, identify and expand existing healthcare programs, support appropriate clinical and medical research, promote medical education to positively impact its targeted communities, and engage in partnerships to foster its goals.